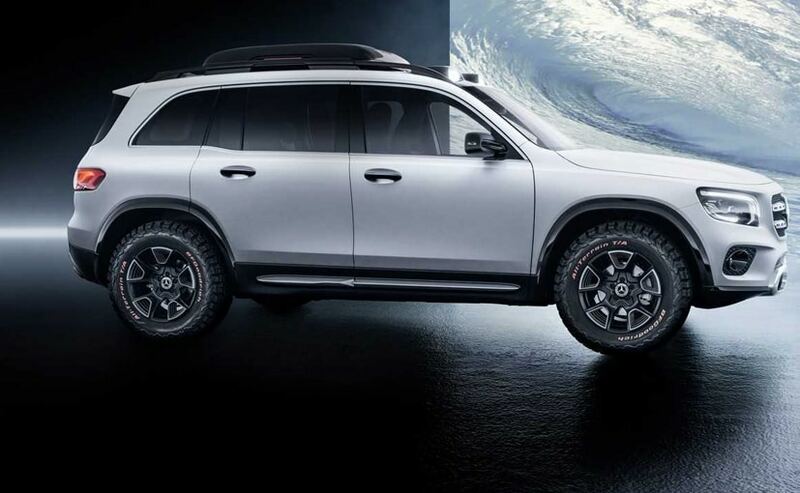 Mercedes-Benz has taken the wraps off the Concept GLB at Auto Shanghai 2019. With the Concept GLB, Mercedes-Benz shows what SUV ideas on the company's compact car platform might be realised alongside the GLA. The concept car has space for up to seven occupants, thanks to its long wheelbase of 2819 mm. The production version of the car will sit between the GLA and the GLC and this is Mercedes's answer to Audi's Q4 and even the BMW X4. The concept GLB oozes modernity with minimal lines and precise joints. The upright front section sees Multibeam LED headlamps. As far as off-road capabilities go, the concept GLB's short overhangs at the front and rear, just make one understand how Mercedes-Benz wants this one to shape up. The long wheelbase and large greenhouse are key factors providing generous space for up to seven occupants. From the side, the Concept GLB looks muscular and the rising beltline adds a bit more perspective. The exterior paintwork in designo cashmere white magno with high-gloss black parts works as a contrast and the discreet orange highlights on the radiator grille and as lettering on the outside mirror housings look great on the concept. The chrome underguard at the front with integral air inlets in a stainless steel look emphasises the off-road qualities. The rear underguard too follows this theme. 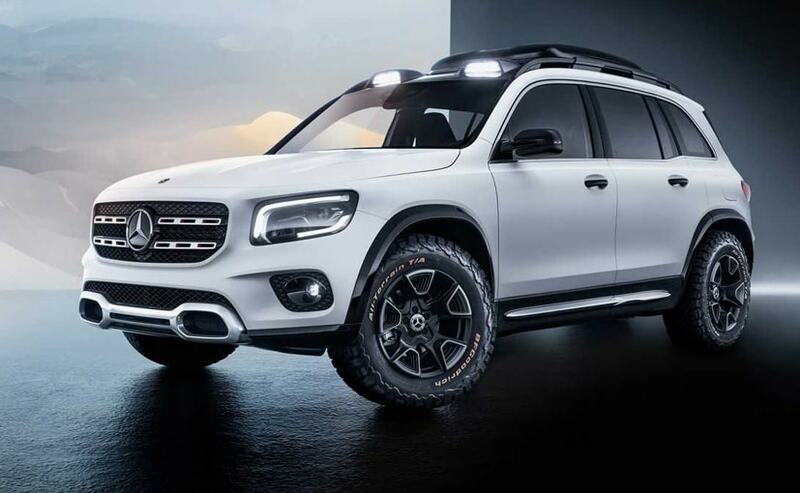 At the front and rear, two shrouds emerge from the roof frame and accommodate LED spotlights acting as ambient lighting and orientation aids when driving off-road. The black roof rails end in a curve at the front and rear. A roof box is mounted on the rear and the aggressive-tread 17-inch off-road tyres are dual tone. Inside, though it's a compact SUV, it gets three row seating. 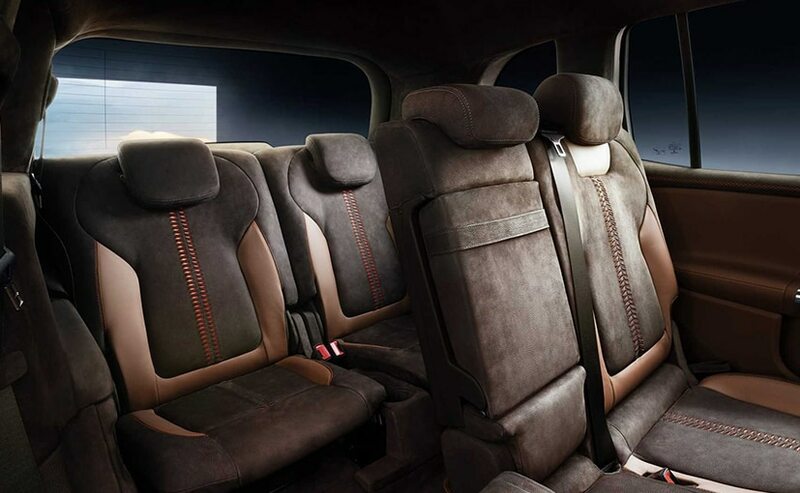 In fact, this is the first time that a compact model from Mercedes-Benz comes with a three row seating arrangement. With two additional single seats that can be recess-flushed into the load compartment floor to increase load capacity; they can comfortably seat two medium-sized occupants. The backrest of the middle seat row is 40:20:40 split-folding, and can be folded down to create a level load surface. To facilitate access to the third row, the seats in the second row have an EasyEntry function: when the unlocking lever on the top outer edge of the backrest is operated, the backrest folds forward and the entire seat can be pushed forward. A total of four child seats can be attached in the second and third seat rows. The basic architecture of the dashboard corresponds to that of the B-Class, with a widescreen cockpit facing the driver and functions and displays controlled via the Mercedes-Benz User Experience - MBUX. New features are the off-roadtype tubular elements in milled aluminium, which round off the dashboard at the lower end. These give the dashboard support an impression of robustness, power and a certain factor of fun. Below the three round centre elements is the air conditioning control panel with an intentionally analogue look, whose buttons create the impression that they have been milled from a solid aluminium cylinder. Under the hood the Concept GLB is powered by the M260 four-cylinder petrol engine combined with an 8-speed dual clutch transmission. The engine is good enough for 222bhp and a peak torque of 350Nm. The engine block of diecast aluminium with cast iron cylinder liners has Conicshape technology, which is also known in-house as 'trumpet-honing'. To further minimize piston friction and lower fuel consumption, the cylinder bore is widened at the lower end of the cylinder liners. The resulting conical shape resembles the mouth of a trumpet.The balance shafts for smooth running are located in the lower section of the crankcase. To enhance comfort even further, there is a centrifugal pendulum damper in the powertrain. The Concept GLB is equipped with the permanent all-wheel system, 4matic, with variable torque distribution. This sporty all-wheel drive configuration allows the driver to use the Dynamic Select switch to influence the characteristics of 4matic. Three characteristic maps are available to control the all-wheel drive clutch, though the system responds flexibly to the current driving situation in any mode. In regular driving operation, the drive program Eco/Comfort is based on an 80:20 distribution, while in Sport it is 70:30. In off-road mode the all-wheel drive clutch acts as an interaxle differential lock, with the basic distribution a balanced 50:50.